With just a few weeks left in the regular season, our three (wait for it) favorite squads have divergent playoffs hopes. East of the St. Croix, the Bucks are in full Fear the Deer mode, battling hard for the 8th and final playoff spot. West of the St. Croix, the Wolves are battling injuries and riding the back of K. Love to a fighter’s chance at the playoffs. And, the third favorite team has nothing to do with a shared border; rather, our third favorite team has everything to do with our interest in the Utah Jazz making the playoffs, and thus, shipping over its first-round draft pick to the Wolves in what is shaping up to be a deep and talented draft. Bucks fans rejoice... #85 Baron Davis is leading the Knicks now. The Bucks are currently 9th in the Eastern Conference, 2.5 games behind the Knickerbockers. Although the Knicks’ season has been uglier than that (Here)WeGo dog from the Bud Light commercials, the Knicks have gone 8-2 in their last 10 games and have somehow come together under Mike Woodson after Mike D’Antoni resigned on March 14. But, news broke this weekend that Jeremy Lin (you may have heard of him) is out for the rest of the regular season with a knee injury. Out goes Lin, incomes B-Diddy… yup, #85 Baron Davis (anytime your point guards number is 85, you know your in trouble and that this guy must be a mental midget.) This is a severe blow to the Knicks and one the Bucks should be able to capitalize on. The Bucks announced their intention to make a run at the playoffs this season on March 13 when they dealt the oft-injured Andrew Bogut and black-hole Steven Jackson for Monta Ellis, Ekpe Udoh, and Kwame “Worst Player in the History of the NBA” Brown. Since that trade, the Bucks have sported a 5-4 record. Unlike his jumper, Ellis’ transition to the Bucks has been anything but smooth. Ellis is a volume scorer – i.e. he takes a ton of shots to get a ton of points. He was supposed to form a fearsome backcourt with Jennings. But, Ellis appeared to be hesitant with his new squad – almost as if he wanted to please his new teammates by not taking the majority of shots. Despite the nearly .500 record, there are some encouraging signs the deal has improved the Bucks: they average 8 more points per game, shoot 4.5% better from the field, and have seen their opponents shoot just over 2% worse from the field. The Bucks have 14 games remaining to make up the 2.5 games and claim that 8th spot from the Knicks. Working in their favor, the Bucks play 9 of those 14 games at home, while the Knicks play only 5 of their 13 remaining games at home. This last part is huge for the Bucks because the Knicks are terrific at home, winning 9 of their last 10 at the fabled MSG. The Bucks next three games are all winnable: @ Washington, vs. Cleveland, and vs. Charlotte. Meanwhile, the Knicks face (sans Lin remember): @ Indiana, @ Orlando, vs. Chicago, and @ Orlando. Needless to say, the 2.5 margin can be made up quickly. And, by the time the Bucks host the Knicks on April 11, the 8th spot could be on the line. The Bucks season can be summed up as follows: they are the best of the worst and worst of the best. They have thrived off beating teams under .500 and been equally ineffective (6-21) against teams above .500. With 7 games apiece against teams above or below .500, the Bucks have a chance to finish the season strong and grab that 8th spot in the playoffs. The moment the Wolves' playoff run ended. 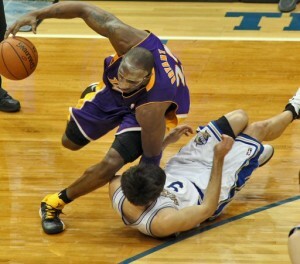 Damn you, Black Mamba! Meanwhile, the Wolves’ playoffs hopes are currently recovering from ACL surgery. The Wolves currently sit in 11th place in the conference, 3 games back of the 8th spot. That may not sound like a lot to make up. But, when players are more fragile than Al Czervik, the playoff run will have to wait for another year. With the likes of El Pistola, Nikola “The Godfather” Pekovic (can anyone explain where that nickname came from?? ), J.J., and even SuperCool Beas sidelined with injuries, its pretty much over. The Wolves’ 3-7 record the past 10 games bears this out. In what’s becoming a nasty trend in the Twin Cities, injuries are rampant (deep breath now: Joe Mauer, Justin Morneau, Denard Span, Scott Baker, Adrian Peterson, Antoine Winfield, Pierre Marc-Brouchard, Mikko Koivu…) and have derailed the season. Right after the all-star break, the Wolves were flying high and closing in on the 8th playoff spot. But, with the bench players now assuming starting roles, the Wolves only shot at making the playoffs is riding the back of Kevin Love and hoping his insane March numbers (30 ppg, 14 rbg, 46% shooting, and 3 treys per game) continue during the home stretch. Even with Love’s MVP type effort, the Wolves simply do not have enough fire-power to fight for that final playoff spot. The four teams ahead of them vying for the 8th spot – Houston, Utah, Phoenix, and Portland – have all been playing .500 ball or better the last 10 games. Which leads me to what should be Wolves fans second favorite team: Utah Jazz. To explain why we care about Al Jefferson again, back in 2009 there was a trade involving Darius Songalia, Bobby Brown (not that one), and Antonio Daniels. As part of that deal, somehow the Wolves ended up with the Jazz’s first-round draft pick this year – lottery protected. Needless to say, I like that deal right now from the Wolves perspective. So, if the Jazz makes the playoffs, the Wolves get their first-round pick (likely late teens b/c there is not a chance in hell the Jazz knock off the OKC Thunder). If the Jazz miss the playoffs, the Wolves get their pick in 2013 provided the Jazz don’t get a pick higher than the 12th. So Wolves fans, let’s take a look at how our second-favorite squad is looking coming down the home-stretch. 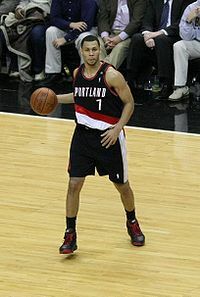 Jazz playoffs = Terrance Ross at shooting guard for the 2012-2013 Timberwolves. Terrance Ross at shooting guard for the 2012-2013 Timberwolves = Playoffs. So, Let’s Go Jazz! Let’s Go Jazz! Let’s Go Jazz!